Biggest adventure of my life! On Salkantay trek you get to see the real side of Peru, local people and lots of animals. People are very friendly and take best care of their team members! The Salkantay trip was the best trip of my life. Juana, our guide and her crew were super friendly and very helpful. I learned a lot about the inka history and their culture. The places and the landscape We have seen during our 5 days trip were simply amazing. Just keep walking… we’ll be there in 20 minutes. The tour was very well organized with our guide, cooks, and horsemen. The scenary was breathtaking. The company was wonderfulm like a family that looked out for each other, and the meals were expertly prepared, ready as soon as we arrived to the sites. challenging but spectacular trek . Food was very good , considering everything was trekked in . A small group size was really great since it allowed us to be spontaneous with activities.The group was a great mix and a lot of fun . We had a great time on the trek. The booking and organizing was really easy and convenient. 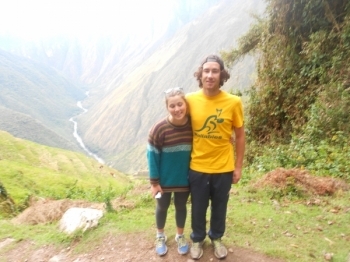 The Inca Trail was an awesome adventure and I will never forget this experience. Thanks to the whole team, you did a great Job: the strong and courageous porters, the fabulous Cook and especially the brilliant Guide Raul. Raul, thank you for an amazing trip, you have made it unforgettable!. When I come back to Peru, I will call you to drink a pisco sour with you, which we didn't had because we had to do the waynapicchu trek! That was not that good, because they burnt down another hill so it was all full of fog. wet , cold, but fun! The hike was amazing and beautiful. Our guide Carlos was fabulous. The food was delicous and very filling. The trek was a blast, even better than i had anticipated. Carlos, our guide was wonderful. He was knowledgable, enthusiastic, and always encouraging when the trek got tough. I started my inca trail adventure with little knowledge on what it entailed, other than day two will be difficult. Needless to say my mind was blown and expectations were truly exceeded. The view while we hiked was always incredible, with plenty of wonderful inca sights to see ok the way. The porters, cook and guide were fantastic. The trek fulfilled my expectations . The food was especially good , bring really good repetient , mosquitoes are a drag and did not anticipate them being so annoying , trekking up to salkantay was the highlight of the route , and seeing the milky way so clearly at nigth camping in the Andes was totally worth it . is mi first time in South América and i did not thing that It was so beautiful i have been in Bolivia but Peru is more beautiful because the people are very friendly the history is so interesting the food is so, so amazing delicious WOW it is something that i never i will forget.